Oskar Kokoschka (1886 – 1980) is another famous name on the long list of artists that weaved their magic in Vienna in the early 1900s. 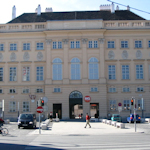 The Leopold Museum has a major retrospective of his work. Kokoschka is one of those Austrian artists whose creativity extended into various media and genres, whether plays or painting, design or expressionism. Born in 1886, the “wildest of them all” spent his formative years in the creative turmoil that was Vienna around 1900. However, while such contemporaries as Otto Wagner and Klimt are almost exclusively associated with the city, Vienna was just one stop in Kokoschka’s extensive biography. The artist’s long life has left a legacy of works across numerous oeuvres, creative phases and locations. Kokoschka’s experiences in Vienna, Berlin, the battlefields of WWI, Dresden, Prague, the UK, and Switzerland all influenced his output…which makes a full retrospective particularly challenging. The Leopold Museum and curator of the exhibition, Heike Eipeldauer, have taken up this challenge authoritatively and comprehensively with the help of the Kunsthaus Zürich, Fondation Oskar Kokoschka (Vevey) and the Oskar Kokoschka Center (Vienna). In the new exhibition, around 260 items illustrate, for example, the diversity of Kokoschka’s works across his life, his political character, his relationship to his home country, and his changing view of the female gender. The exhibition takes you all the way from Kokoschka’s early works, with the angularity of his nudes carrying echoes of Schiele about them, through to his final paintings that acknowledge the passing of his life. The self-designed poster for his 1909 play, Mörder, Hoffnung der Frauen (Murderer, Hope of Women). The strong colours contrast with the subtler gradients of the surrounding oil paintings from the same time. Kokoschka’s expressionist portraits in oil, each so very different from the next with an element of caricature about them. This particular gallery feels like a casting call for an Agatha Christie film with its array of characters and personalities. The gallery covering his relationship with Alma Mahler (the end of that relationship drove him to sign up for military service in WWI). His double portrait of himself and Mahler from 1912/1913 seems to say everything in the positioning of their hands. Not quite touching…near and yet so far. Two examples of the fans he made for her are quite stunning, too. As you enter gallery 7, you can see a 1937 “self-portrait of a degenerate artist” framed in an entrance to the following room (kudos to the curator). Even at a distance you can feel the welcoming, yet defiant, gaze that seems years from the apparent torment implicit in the earlier works. The 1950 Prometheus triptych is remarkably impressive, like a Kokoschkaesque vision of classical motifs familiar in giant baroque frescoes and renaissance paintings. The Kokoschka exhibition runs from Saturday, April 6th to Monday, July 8th, 2019. You don’t need an extra ticket, just a normal entrance ticket to the Leopold Museum. The museum opening hours are 10 am to 6 pm (9 pm on Thursdays). It closes on Tuesdays most of the year, but opens daily in June, July, and August. See the Museumsquartier article for travel tips. The Leopold Museum is on one side of the central plaza and impossible to miss.